Be able to define an element. Be able to recognize and recall some of the basic elements. Any material that is composed of only one type of atom is called a chemical element, a basic element, or just an element. Any material that is composed of more than one type of atom is called a compound. Every element has a unique atomic structure. Scientists know of only about 109 basic elements at this time. (This number has a habit of changing.) All matter is composed of combinations of one or more of these elements. Ninety-one of these basic elements occur naturally on or in the Earth. The other elements are man-made. You may recognize the names of some of these basic elements, such as: hydrogen, helium, oxygen, iron, copper, gold, aluminum, uranium. 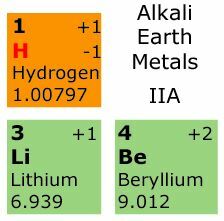 The periodic table of elements (shown below) lists the basic elements and some of their properties. An element is material composed of only one kind of atom. A compound is material composed of more than one kind of atom. Some examples of elements that can be found on the periodic table are hydrogen, helium, oxygen, iron, copper, gold, aluminum, uranium.